Different groups gathered at Phillips Square on to protest capitalism and austerity on May Day. – A.I. More than a thousand people met at Phillips Square on May 1 to protest the austerity measures put in place by the Quebec Liberal government. Protesters included students, workers and independent parties. The May Day protest lasted well into the evening, with many scuffles throughout the downtown core between the police and students, workers and protesters. According to Radio-Canada, 84 arrests were made. The march began at 7 p.m. when protesters tried to head up Aylmer St.— in the direction of traffic. Riot police blocked their way and and pepper sprayed protesters, trying to direct the protest down a different street rather than disperse the crowd. As the protest marched down de Maisonneuve Blvd. it met another blockade on McGill College Ave. where police deployed tear gas and pepper spray after a protester lit a flare. He was quickly tackled and knocked down by police. Once the march started turned east on Ste-Catherine St., police officers started dispersing the crowd by splitting the group in two and firing tear gas down the major downtown artery. According to CTV News, it was quickly declared illegal at this point. They also proceeded to disperse the half that remained on McGill College St. by charging the crowd while banging on their riot shields. Many bystanders were hit by pepper spray and tear gas, including a five-year-old child who was quickly treated with a combination of Maalox (an antacid) and milk. The protest then split into smaller groups and one major group headed towards Guy-Concordia Metro. The group consisted mostly of hooded people, dressed in black, all utilizing the Black Bloc tactic. Black Bloc is a tactic used by anarchists wherein they cover their faces and dress in full black garb. Some people continued to block the streets with signs and construction cones. Throughout the walk protestors picked construction cones to throw in the middle of the street with the intent of disrupting traffic. The night ended shortly after that. According the SPVM one police officer was injured and sent to hospital and some vehicles were damaged. Riot police block McGill College after a clash with marchers after a protester lit a flare. – A.I. Masked protesters use road signs to block traffic on Maisonneuve St. – A.i. 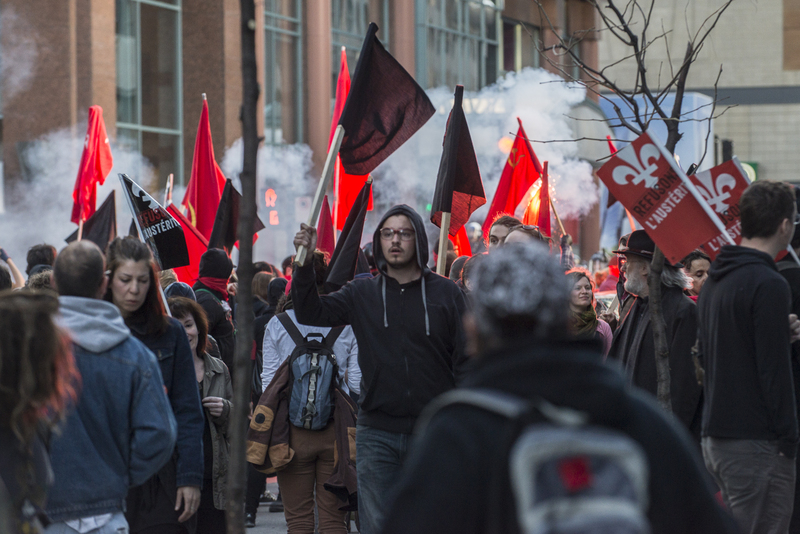 A masked protester waves a black flag on St-Mathieu St. – A.I. Cones left on Sherbrooke St. to disrupt traffic after protesters passed.- A.I. Protesters march down Crescent St. as bystanders watch – A.I. A flare was lit as riot police fired tear gas and pepper spray on McGill College, clashing with protesters.- A.I. A final protester stands in defiance as riot police yell at him to back off because he is too close.- A.I.